Retail spending eased back in January as myriad factors influenced consumption. Poor weather was the largest culprit in the decline, though other hurdles kept shoppers at home and offline. The expiration of long-term unemployment benefits for 1.3 million people at the end of December curtailed spending, while evidence suggests that the slowing pace of personal income growth is beginning to weigh on the rate of retail sales gains. As a whole, however, the economy is on solid footing and the setback in retail sales and job growth over the last two months is likely temporary rather than a long-term trend. Consumers are juggling new priorities, including the cost of government-mandated health insurance, rising interest rates resulting from the Fed “taper” of Quantitative Easing, and a correction in the equity markets. When strong employment growth resumes and the skies clear, shoppers should return. In January, retail sales declined 0.4 percent, while core retail sales (excluding autos and gas) dipped 0.2 percent. The retrenchment was fairly broad-based, and led by motor vehicles and parts (2.1 percent), sporting goods (1.4 percent), and clothing and accessories (0.9 percent). The most shocking decline was in the nonstore segment including Internet sales, which dipped 0.6 percent and is not easily explained by inclement weather. Although the overall report is weaker than anticipated, some bright spots emerged last month. Sales at building supply stores expanded 1.4 percent as consumers sought tools to combat the cold and snow. Grocery stores also benefited from residents hunkering down in January, though the 0.2 percent increase came at the expense of restaurants, which posted a 0.6 percent decline in sales. 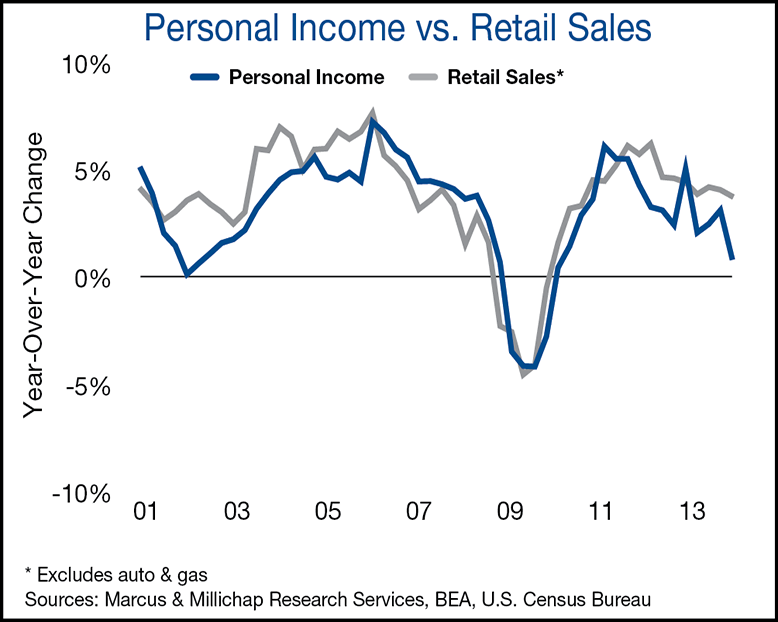 The impact of weak income growth is becoming a larger concern for the long-term prospects of retail sales. Shoppers’ budgets are increasingly stretched to maintain current consumption levels, which will only be maintained through income growth or the accumulation of debt. Core retail sales are 14 percent above the pre-recession level while household debt is more than 10 percent below the previous peak. Revolving credit surged at the end of last year, an indication that consumers are confident in their prospects and could support retail spending levels. While retail spending has returned, the impact on operating fundamentals at “brick-and-mortar” stores has been muffled by the sheer size of the space overhang and number of retailers going dark. Even now, more than four years after the end of the recession, several national chains remain in jeopardy, including Red Lobster and JCPenney. Nonetheless, retail vacancy will drift down 70 basis points to 6.5 percent. Warehousing and manufacturing are highly dependent on the retail sector, so a pause in spending could cool the impressive gains in the industrial commercial property sector over the past few years. Industrial vacancy stands at 8.2 percent, approximately the same rate as prior to the recession. If the U.S. economy expands by more than 3 percent this year, vacancy will retreat another 100 basis points into the low-7 percent range. This entry was written by marcusmillichap, posted on February 14, 2014 at 6:04 pm, filed under Uncategorized and tagged CRE, retail. Bookmark the permalink. Follow any comments here with the RSS feed for this post. Post a comment or leave a trackback: Trackback URL.